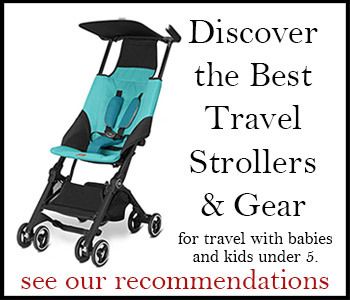 Our recommended travel high chairs, dining boosters, and travel trays. Sometimes travel high chairs can be more easily found than you’d think–like when you just need a tray to add to simply convert your stroller (or car seat!) into a dining booster on the go. Or perhaps you’ve had enough of the old-stand-by square restaurant high chairs with no tray at all–that put nearly everything you don’t want in baby’s reach pretty much there? Just add this: The Star Kids Snack & Play travel tray may be just the multi-purpose solution you need in your travels. Since it’s soft, you can roll or fold it to stuff beneath your stroller, too hands free for the luggage cart, your child’s stroller, too. I have never seen a dining booster fold this flat. The front and back of the base cleverly fold underneath and the back folds down, leaving the whole seat no more than 1″ thick. Add to that: It’s as light as your socks! Very easy to travel with in daypack or diaper bag, and slips under the stroller with ease. The Inglesina Fast Deluxe is another very lightweight option, but it features a higher back with some padding for comfort, and it fits thicker tables–up to 3.5″ thick. Includes removable washable padding and a three-point safety harness. For children up to 37 lbs. Folds to 14″ x 17″ x 4″. Weighs 4 lbs. Tip: Hook-on chairs should not be used with glass tabletops, tablecloths, or on table extension leaves. The Easy Diner gets around a wide variety of table ledges (or “skirts”) that can be troublesome with many other models of hook-on travel high chairs, and it provides padding from top to bottom for supreme comfort. This hook-on chair also has a higher weight limit than most others (not counting the Me Too), ensuring you will get your money’s worth from longer use. What’s more, it offers a 5-point safety harness that converts to a 3-point for the older child. Babies may begin using once they can sit up unassisted, up to 37 lbs. Folds flat for travel with its own carrying case. Weighs 7 lbs. It’s a truly travel-friendly “booster.” The On the Go packs down to only 2″ thick, then self-inflates to give a 4″ boost to hungry kids on the go (a great alternative to “making due” by dining with your child on your lap). Straps securely to most restaurant chairs with adjustable seat and back straps. Three-point safety harness. Recommended for 12 months to 36 months. Weighs 2 lbs.